Record-setting launch numbers for Grand Theft Auto IV had no significant impact on Take-Two's stock price this morning, lending credence to analyst views that the share price already included the expectation of extraordinary first-week sales of the title. What does this mean for EA's ongoing bid for Take-Two? Cowen and Co. analyst Doug Creutz said this morning that even the GTA IV launch couldn't have elevated the share price from January's 17 dollars per share to its current 26-dollar range, and that right now the elevated price is due to investor eagerness for the sale. "Take-Two's self-imposed moratorium [on negotiations] is over," said Creutz. "We haven't heard anything out of either company in the last week. They could be talking... I still think the odds that the deal happens that are very high... I don't think GTA changes that at all." Just how high are those odds? EA continues to point to the ticking clock, and just recently told GamesIndustry.biz that the chances of a deal happening are "now 50/50 at best." "I think it's more like 80/20," said Creutz. To understand the likelihood, Creutz cites an example from elsewhere in the market. Adjacent to this ongoing battle, we've seen Microsoft launch a similarly aggressive bid to acquire Yahoo! — and fail. 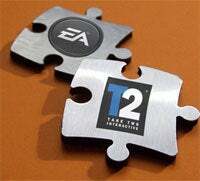 But according to Creutz, the EA-Take-Two bid is an opposite scenario in every way. "EA's shareholders want this deal to happen; they understand how potentially accretive this deal is," he said. "If you compare this to Microsoft and Yahoo!... Microsoft shareholders didn't really want the deal, and Yahoo! 's management wanted to stay in charge. EA shareholders do want this, and Take-Two management have a lot of incentive to cash out so they can move onto the next project." A Take-Two spokesperson said today that the Board will do "the right thing" for its stockholders: "Toward that end, we are committed to a process of considering all strategic alternatives to maximize stockholder value, including remaining independent. We have said that we were willing to begin formal discussions with interested parties on April 30th, after the launch of GTA IV, and we have continued to observe that timetable." The spokesperson also reiterated it had received interest from "various parties" since the EA bid went public, but analysts have repeatedly noted a so-called "white knight" has yet to appear. Creutz is of the opinion that EA will have to bid a little higher to make the deal happen. "EA can cut a lot of costs [in the event of an acquisition]," he said. "They don't have to have Strauss [Zelnick] and Ben [Feder] around; they can get rid of the corporate overhead. There's a lot of cost synergy with sales and marketing reorganizations and probably on the R & D side. A deal has the potential to add a lot to EA's earnings power; because of that, they can afford to pay more." So why hasn't EA raised its bid? "You don't go public with your best offer; it's negotiating 101," said Creutz. "I think EA's willing to raise the bid once to get it done, but they have to take a hard line, otherwise Zelnick is going to walk all over them. Zelnick has to play it the same way." "It's a game of chicken. Neither of them really wants to lose here, and neither of them wants this to blow up." Are the parties talking? What does Take-Two consider an adequate offer? "We are not going to comment on specific conversations with third parties, nor will we speculate about the 'right' stock price," said the spokesperson. Creutz also suspects bravado has a big role to play in this "game of chicken" — "If this deal doesn't happen, it's because egos got in the way, and both sides are going to walk away feeling a little stupid that they let this slip through their fingers," he said. EA's Jeff Brown was unavailable for comment.